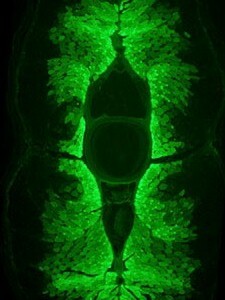 Apart from (presumably) tasting good and looking pretty, the fluorescent protein – called UnaG – from Unagi eels may be able to form the basis for a diagnostic test for liver disease. UnaG only fluoresces when bound to bilirubin, which is a break-down product of haem, the molecule that carries oxygen in the blood. Livers with impaired function have difficulty further processing the bilirubin before it is excreted, leading to a build-up of bilirubin in the body, and in extreme cases to jaundice. So the intensity of UnaG fluorescence can be used as a read-out for how badly the liver is damaged. And now for something completely different: next time I’ll be writing about what it’s like to be an intern at the journal eLife! This entry was posted in Factual and tagged biochemistry, Cell biology, eLife, fluorescent proteins, GFP, microscopy by Victoria Wang. Bookmark the permalink.